It’s been over 8 months since former President Goodluck Ebele Jonathan of the People's Democratic Party handed-over the mantle of leadership to President Muhammadu Buhari on the 29th of May, 2015 and Nigerians are still waiting for the 'change' marred with failed campaign promises. The significance of the ruling party metaphorically 'eating its words' to stay alive in the face of the cash crunch speaks volume of the party's lack of readiness to rule Nigeria but only to secure political power willy-nilly. It took President Muhammadu Buhari 5 good months to appoint his cabinet members. His excuse was that his administration was trying to estimate the state of all the government ministries. We all patiently waited for the 'angelic Ministers' of change until he presented some regular politicians with tainted names. His lateness in the appointment of Ministers laid the foundation for the hush-hush preparation of the 2016 appropriation bill that stirred up controversies. During the twilight of Goodluck Ebele Jonathan's administration, the price of oil in the international market started falling. The price per barrel stood at $50 with Economic Analysts predicting an all time low value but Nigeria's political messiah, APC developed no contingency plan to turn the economy around in the face of the economic crisis and it will shock you that Buhari's budget of N6.08 trillion betrays the principle of cutting one's coat according to his size. The economy is virtually run with inactions which prompted the Nobel laureate winner, Wole Soyinka to advocate for a national economic conference to ameliorate the situation. I am an APC sympathizer but the party has to accept its level of emptiness in the promises made during election campaign period. The Vice-President, Yemi Osinbajo claimed no youth qualified for an appointment to Buhari's cabinet out of the over 64 million youths (age 15-35) Nigeria comprises of. This is laughable and it all bores down to a lack of an instituted structure or sketched plan to accommodate a youth like we have in the United Arab Emirates today. Goodluck Jonathan has been blamed for the current strength of Boko Haram, unemployment, corruption, poor infrastructural facilities, fuel scarcity and even the recent outbreak of Lassa fever amongst others. The Minister of Information and Culture, Lai Mohammed even reiterated that the APC wouldn't have stood a chance if Jonathan's administration was favourable to Nigerians. Invariably, Jonathan is being blamed for APC's victory at the centre. I want to use this juncture to remind the ruling party that government is a continuum. The past shouldn't be an impediment to the future and good leaders are made in tough times. The blame game is a subtle escape route for cluelessness. The Nigerian masses are hungry for results. The kidnap of over 230 Chibok school girls in Borno state during the Jonathan-led PDP administration was well capitalized on by the APC during the presidential election campaign period. I will not blame the APC government for its failure to rescue the girls as promised but President Muhammadu Buhari's statement of setting up a panel of inquiry for a fresh probe into the Chibok girls abduction after 6 months of his assumption of power while meeting with the #BringBackOurGirls campaign team and the parents of the victims in Aso Rock Villa, Abuja speaks volume of expertise in talking the talk and not walking the walk. APC did a good job with the criticisms on the abduction but nobody ever thought about proffering a solution to the recovery of the innocent girls. 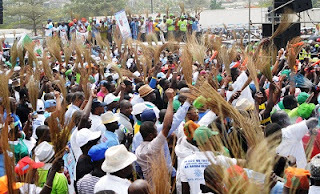 The APC has spoken in different tongues on the N5, 000 palliatives for unemployed youths before Buhari recently cleared the air. Lai Mohammed did a wonderful job twisting the welfare package to benefit only the 'vulnerable' Nigerians. Who isn't vulnerable among the masses? Well, I was shocked when the State Minister for Labour and Employment, James Ocholi (R.I.P) stated there was no data available for the number of unemployed youth to operationalise the programme meaning it was a ruse all along. The increase in the level of unemployment and under-employment was one of the major reasons why most Nigerian youths joined the APC bandwagon as the party strongly expressed its commitment to provide jobs to boost the economic status of the people. Well, APC easily identified the problem without a tested measure to resolve it. This accounts for the anger of youths expressed via social media with various Twitter hashtags. Lai Mohammed added salt to the injuries of people by claiming the party never promised to 'give jobs' but simply 'create jobs'. Isn't that tricky and smart of this current administration? That 2016 national budget was trailed by criticisms from the first day it was presented as it was an embodiment of misplaced priorities and lack of planning. Till date, there are mixed reports on the budgeting system. This prompted the eventual theft of the appropriation bill. It was later withdrawn officially and represented before we were ushered into the episode of 'budget padding'. With the national budget representing the plan which a state construction process follows, one would wonder if the APC ever thought of winning the highly heated 2015 presidential election. The power sector is key to the economic development of Nigeria. With stable electricity supply, cost of production of companies will reduce, goods and services will become cheaper, entrepreneurs will emerge with small businesses of growth potentials due to the enabling ground, and life will be more comfortable for the people and other benefits. You will agree with me that there is no significant improvement in that sector since the emergence of the former Governor of Lagos state, Babatunde Raji Fashola as the Minister of Power, Works and Housing. Not even an act of body language from the minister who probably uses a generator to supply power in his own house. Fashola's 45% increment in electricity tariffs without focusing on the supply of power has defamed the APC. This is a mere show of guess work and eleventh hour rush. In more 8 months, President Muhammadu Buhari has travelled to over 20 countries, jetting out about 25 times in the face of the cash crunch crippling Nigeria. This is an action he criticized the administration of former President Olusegun Obasanjo in the year 2003. Nigerians are yet to see the benefits of the expensive foreign trips even though China has pledged to invest $60 billion in Africa and the United Arab Emirates has pledged to assist in the repatriation of stolen funds stashed in the country. Buhari is desperately seeking for Foreign Direct Investment forgetting the fact that the development of infrastructural facilities is the key to attracting foreign investors and not wooing them with words. Buhari's recent signing of Bilateral Air Services Agreement (BASA) with Qatar to pave way for direct flights between major cities of both countries is highly questionable considering the fact that Qatar has delisted Nigeria from countries its giving visa for entry as they probably regard Nigerians as unfit for their country. This is just a few of terrible feedback that have leaked to the public.